We were on a Costa Rica cruise, sailing on the Safari Voyager with UnCruise Adventures. Costa Rica cruise with UnCruise Adventures – They’re different, baby! UnCruise Costa Rica and UnCruise Panama – Itineraries, rates, etc. 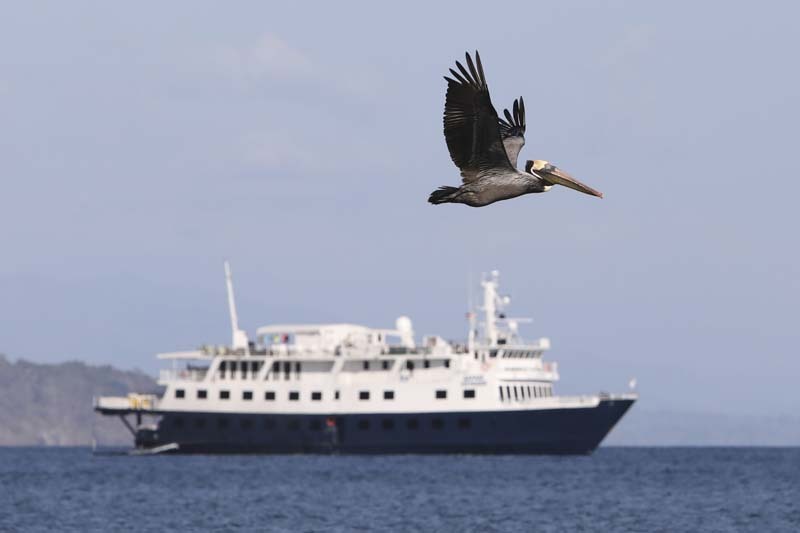 UnCruise Adventures operates eight small adventure vessels (maximum 84 passengers) in Alaska, Hawaii, Central America, Mexico and the Galapagos. You won’t find a casino, jewelry shop or pool onboard. And you won’t spend much time in your cabin, or want to. 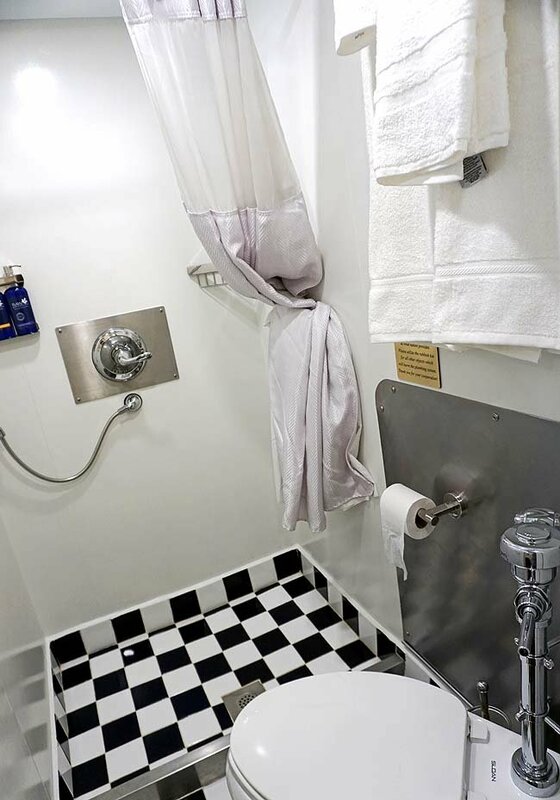 Cabins, though comfy with ensuite bathrooms, are much smaller on UnCruise ships than staterooms on larger, traditional cruise ships. Our Safari Voyager cabin was cute, but really cozy! 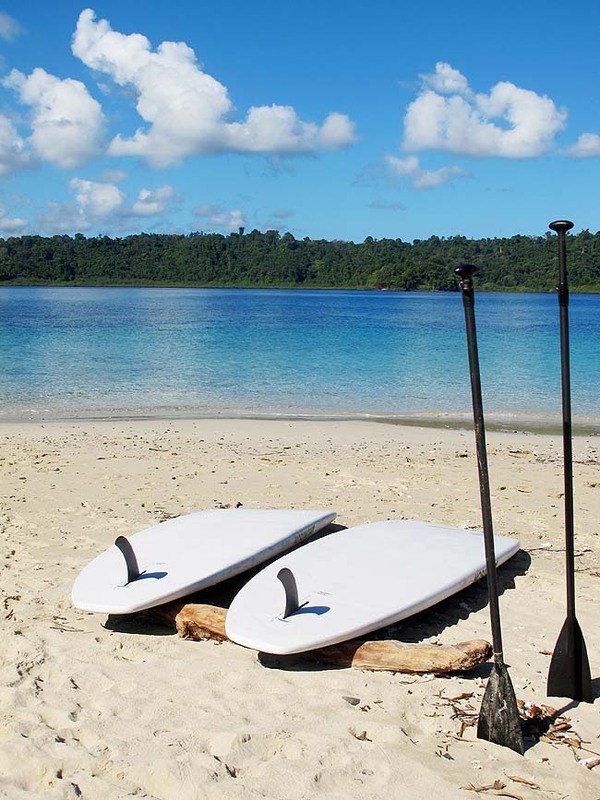 Rather, you’re outside in nature – hiking, kayaking, swimming, snorkeling and spotting wildlife on skiff excursions. You’d prefer to enjoy unique adventures in Costa Rica like kayaking to spending time in your cabin, right? And, sorry, no duty-free shopping! 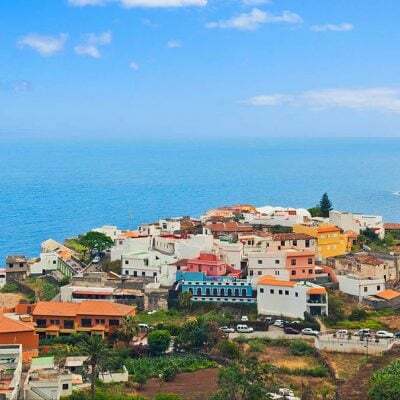 There are few (if any) ports or towns on most UnCruise itineraries where you can get out and shop. 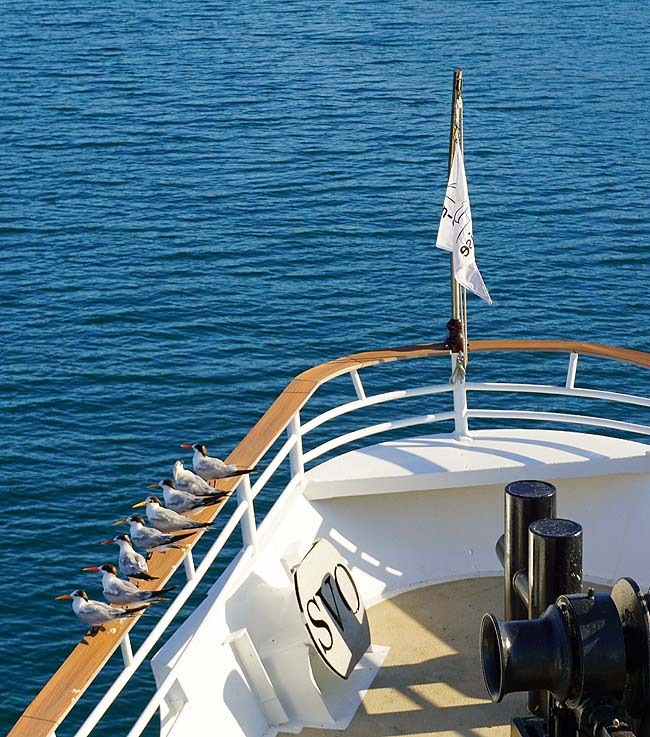 If you want a luxury cruise, see what it’s like on the Seabourn Odyssey – click here! With UnCruise Adventures, you visit deserted islands, national parks and remote wilderness areas. Take our snake encounter on our Costa Rica to Panama cruise. That was on a hiking foray in the dry forest of the Curu National Wildlife Refuge. The ship anchored off the non-touristy, southeastern tip of Costa Rica’s Nicoya Peninsula; guests were ferried ashore in rigid Zodiac-style inflatables. And like all landings on our Costa Rica cruise (and in Panama), it was a “wet” landing – where, steadied by crew, we slid off the inflatable into knee-deep water and waded up onto an isolated beach. More hiking and wildlife highlights followed on our third day when we ventured into the lush rainforest of Costa Rica’s untouched Osa Peninsula. We’d been told three pumas and a jaguar roamed the Campanario Biological Station property which we walked in the morning. The sound of cicadas was almost deafening as (mindful of any camouflaged poisonous snakes) we trod carefully over gnarled roots along the leaf-strewn path, our eyes darting from left to right, internal antennae on high alert. No matter that we didn’t see a jungle cat – the exuberant beauty of the giant mahogany and “walking” mangrove trees was reward enough. When you cruise Costa Rica with UnCruise, you have tough decisions to make, as different activities are offered ashore at each anchorage. That afternoon, we had one such tough decision to make. Or join Rey on a long, “guide’s choice” coastal hike which he promised would bowl us over with its scenic beauty? And in the excitement of spying not one, but two, neon- yellow toucans soon after setting off, we forgot about the energy-sapping humidity that soon slowed our stride down to a mere strolling pace. The toucans were easier to spot than the three-toed sloth we’d seen our first day in Manuel Antonio National Park. Looking like a coconut-sized bump high up in a tree, the sloth – greenish in colour from the algae that flourish in the fur – had blended in perfectly with the forest canopy. We’d needed our guide’s telescope to make it out. By contrast, these toucans were hard to miss once Rey pointed them out. Ditto the white-faced capuchin monkeys jumping in the trees. Locals dub them “mafia monkeys,” as these charming thieves steal food and camera lenses from unsuspecting visitors. Crossing a sweet beach cove – with grey sand, fine as powder – we met a family group lounging in white plastic chairs at the water’s edge, beers in hand. We wondered how they happened to be here in this remote piece of wilderness paradise. It turned out they were also Canadians, from Ontario, who’d rented a nearby house (invisible from the beach) through VRBO. It was only accessible by boat, and their groceries had been shipped in by water taxi. A bit further on, we stopped to watch a startling scene. The sea was bubbling and boiling up with fish beneath a cloud of dive-bombing pelicans! And whooping and hollering, two local fishermen raced into the water, tossing their lines in. Within minutes, they reeled in four fat silvery jackfish. Dinner, they proudly explained, was going to be good that night, fried up with oil and garlic. Just before meeting the boat that would pick us up, we came across a palm-fringed lagoon. It looked very inviting for a dip. “A swim here would be great if it weren’t for the crocodiles,” cautioned Rey. And sure enough, what looked to be an innocuous log on the bank lazily rose up on stubby legs and slid silently into the water. 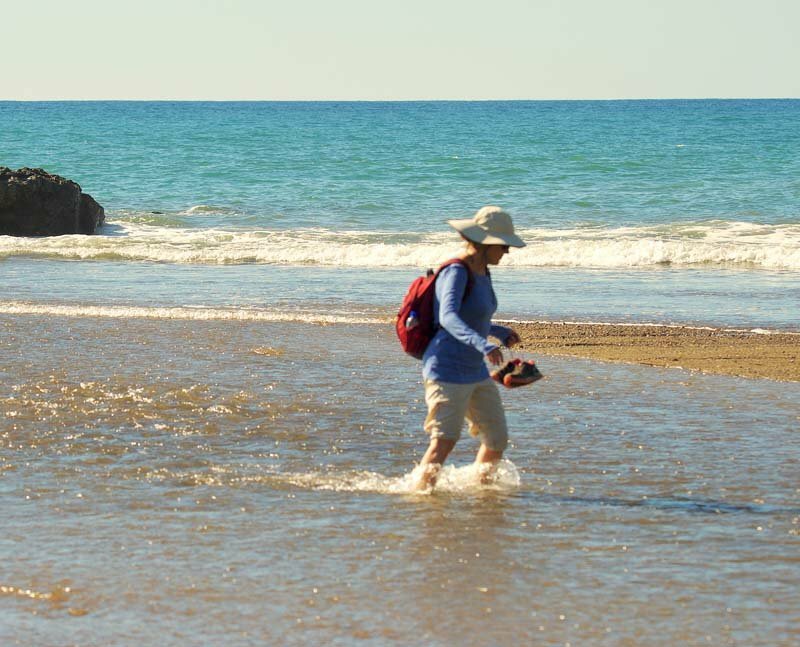 Hiking is all well and good, but UnCruise Adventures knows of beautiful beaches in this part of the world. We were ready for a beach day when we called in at Granito de Oro (“Grain of Gold”) the next morning. This tiny uninhabited islet off Coiba National Park in Panama – with clear turquoise water lapping onto a blindingly white sand beach dotted with palm trees – is about as perfect as a tropical island can get. A kaleidoscope of colorful fish scenes unfolded underwater – yellow-and-black striped Sergeant Majors darted about, balled schools of silver jackfish swam by, puffer fish hung effortlessly in the water. 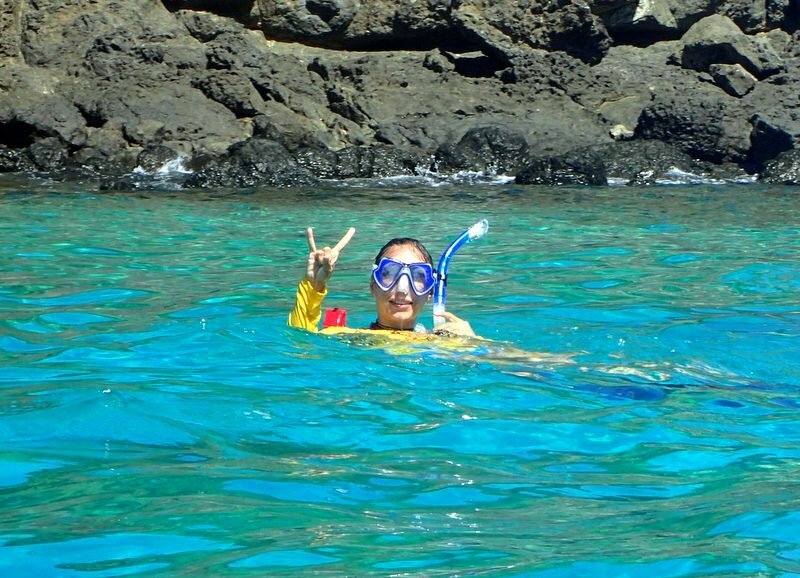 Some lucky guests even saw a white-tipped reef shark. 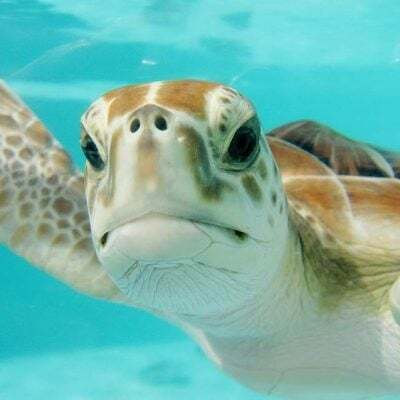 And in a Zen moment, a green loggerhead turtle glided by gracefully just below the surface as we tried our hand at stand-up paddleboarding. Come evening, we always looked forward to “happy hour.” That’s when everyone mingled over drinks, shared the day’s experiences and learned about the next day’s adventures from the expedition team. Happily, all cocktails and wines are included in the Safari Voyager’s rates because we took a particular liking to the “Valencia” – brandy, apricot liqueur, fresh orange juice and sparkling wine – that Daniel, the bartender, shook up. UnCruise reviews invariably mention the good food. And meals were delicious! Sample dinner: Spiced carrot soup, followed by leg of lamb with eggplant and saffron rice (or for seafood lovers, shrimp with chipotle honey sauce). We completed our cruise from Costa Rica to Panama navigating the 48-mile length of the Panama Canal, most of which is a vast man-made lake studded with islands and tropical vegetation. At the canal’s entrance, sitting on deck at sunset, we were spellbound by the original locks’ operation. Running on steeply rising tracks along both sides of the locks, electric locomotives (called “mules”) attached to the ship by cables, seemed to pull the ship along. (In fact, they keep a ship from bumping into the sides of the canal as it passes through the locks). The whole experience was quite surreal – it’s impossible not to be amazed by this ingenious lock system, which raises ships about 80 feet above sea level at one end of the canal, then lowers them back down again at the other. As a goodbye to our time in the world of nature, the passage through this man-made marvel was perfect for re-entering the world of civilization. The newly refitted Safari Voyager sails various Costa Rica and Panama cruises year-round. New for 2019 are 10- and 12-night cruises combining Costa Rica and Panama into longer, more indepth voyages. Starting in April: The Safari Voyager will sail 12-night “Pure Panama and Costa Rica” cruises. Highlights include exploring Costa Rica’s Curu National Wildlife Refuge and Osa Conservation Area (like we did); a late afternoon/evening transit of the Panama Canal; and in Panama, visits to Guna Yala (the San Blas Islands), Fort San Lorenzo, Pearl Islands, a visit to an Embera village in the Darien Jungle and Coiba National Park. Come November and December: 10-night cruises will do the same itinerary, minus Panama’s Guna Yala islands. UnCruise rates include cruise accommodations, meals, all alcoholic drinks, guided adventure excursions and onboard naturalist talks. We loved the boutique Global Hotel Panama (see our review). See the UnCruise Adventures website here. Nice! Our North Shore News story on cruising Costa Rica just took home a Finalist award in the “Cruises (Print Publication)” category in the 2017 North American Travel Journalists Association (NATJA) awards. I did the Uncruise Alaska trip this past May (2018) and I fell in love with Uncruise. 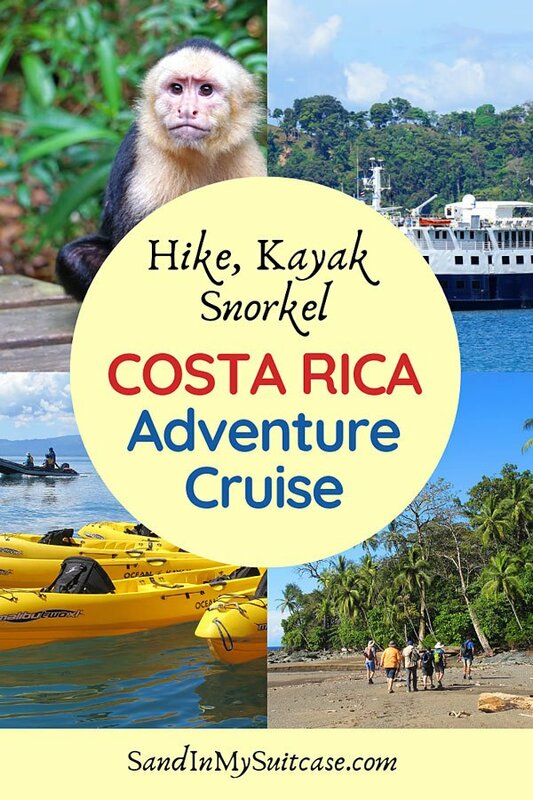 I have always wanted to see a real rainforest and this part of the world so I have the UnCruise Costa Rica trip scheduled for April of 2019. I am even more excited now after reading your article. Thank you! You should have a great time! You’ll get lots of rainforest in Costa Rica :-). Take comfortable sneakers/light hikers — ones that can get wet if you have to hop from rock-to-rock in a creek. Lots of scenic hikes are on the itinerary! Oh wow gorgeous scenery and wildlife – that monkey looks so cute! The monkeys were some of our fave animals. We could watch them for hours! Very nice – I’m not into cruises but THIS cruise I would do…sounds like an adventure and not a floating all-inclusive. The size of the boat just right and the rooms look cosy. Very nice. Nice writeup! This is the kind of thing I need to point my parents towards. They’d love to see the jungle, but wouldn’t be comfortable doing it overland. Fantastic monkey photo as well! Most of the places we went to would be almost impossible to access on your own (at least to try to do this sequentially). Some were really remote – off-the-grid with no A/C. Our ship offered us a comfortable way exploring this part of Costa Rica and Panama… We had a great time! What a great “UnCruise” adventure, immersed in the outdoors—with a ship as your home and all of nature and the outdoors as your backyard! We couldn’t have survived without the comfort of the ship to return to! A shower, then one (or more) of Daniel’s magical cocktails was a welcome treat at the end of an adventurous day :-).